Plate from first Ipswich locomotive, 1877. Builders’ plates are affixed to locomotives and other rail transport to record when and where they were constructed. 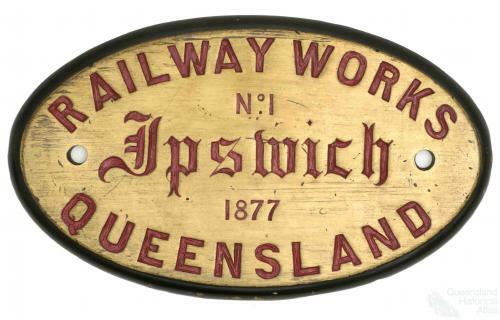 This brass plaque was attached to the first steam locomotive built at the Ipswich Railway Workshops. It commemorates the origin of an enduring Queensland industry. Description: Oval shaped brass plate, front surface polished. Red paint infill in text and black painted border. Back surface has circular section recessed at centre and around mounting holes.